During my teaching career, I often heard colleagues claim there was no such thing as a bad or dumb question. I never agreed. While you'd never let on to a student, some questions begged a double take or pregnant pause. So it goes with coaches who regularly fire me questions. The vast majority are legit. But occasionally I answer with my own. The technique reminds me of a school principal I knew who, when confronted with a staff member who'd done something questionable, would lean forward and ask, "Why would you do (or say) that?" Very off-putting. Questions or comments meant to elicit a rise out of me are the real posers. Such as, anything about officiating. Most recently, at a seminar about defensive play, a coach asked me how best to communicate with a referee who refused to come to the bench to explain calls. The coach said he was miffed by a few calls and kept gesturing and asking for the referee to explain. He stayed away. 1. What team do you have? 2. What's the answer to #1? "Why," I replied, "are you even bothering with that?" Not what he wanted to hear. Then he tried to justify it by fumbling around an explanation of the importance of the calls, the score, and even how he was trying to show his 10-year-olds how to talk with refs. He could see I wasn't buying it. I wasn't about to embarrass the guy, but I could tell from the looks on the faces of the other coaches they weren't buying it either. "Is the score important?" I began. "Are the infrequent penalties in a house league game significant? If so, why?" No, I said, the calls aren’t important. You’re simply distracting you and probably the kids. 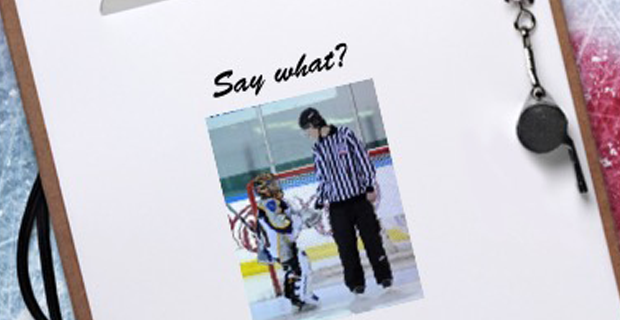 Use the penalty calls as teachable moments to the team on how to position oneself or stick check legally, etc. Besides, even if it was okay to talk to the official, consider your tone, body language, situation, all from the official’s perspective. As minor coaches, we need to stop following the leads of junior or pro people for whom a lot rides on a result. In the real world, why would you do/say anything?